I don't scrap about our tree every year, but once in a while I like to capture what it looked like and talk about any new ornaments we may have added. This year was a "big" year because Alexa decorated the tree all by herself for the first time (while I put out other holiday decor and Tom hung the wreaths). I think she did a great job! your tree looks lovely! and you layout of course is amazing- i just totally love this collection!! The tree is gorgeous and so is this layout! Love the big santa at the bottom. This is beautiful!!!! LOVING the photo (She did a GREAT job decorating!!!) and loveeeeeeeeee the Santa paper!!!! What a layout and a perfect way to remember this memory :) I love that she decorated the tree while you guys did the other decorations!! Love the tree and layout. And love all the red and green on the white background. Alexa did a GREAT job! Loving all the layers/clustering on this layout, beautiful! oooo beautiful tree! and i love the page. the colors pop and everythign is so clean and crisp. Cool layout. Love all the embellishments!! very cool Lisa, I need to start scrapping about my tree every year. I love your layout the paper is so much fun. I take a picture of my tree every year but it hardly makes its way onto a page. What a gorgeous tree! Love the layout! I also loved how you used the Santa paper! It's just perfect! She did a great job. Love that collection. Your layout is very nice. My tree almost always looks the same from year-to-year its hard to scrap. Although it has changed shape (live-artifical-live). Great layout and love how you used the santa paper. Lisa! the design and flow of this layout is amazing! 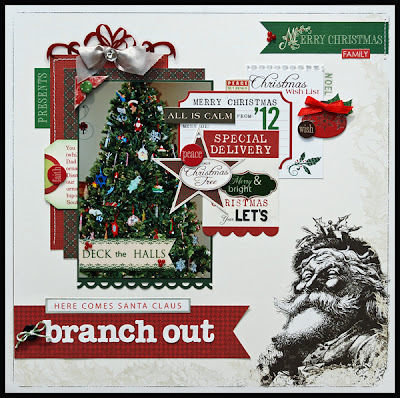 This page is way too much fun with all the layering, and I love your vintage Santa! Your daughter did a beautiful job on the tree. Your page turned out gorgeous as well. Your daughter definitely decorated the tree beautifully! What a great layout and a good reason to scrap about your Christmas tree this year!! !